The announced attendance at Friday’s game in Kelowna was 5,002. That number on Saturday night was 5,009. The Rockets won 4-2 on Friday and 5-2, with two empty-netters, on Sunday. . . . According to the WHL’s 2015-16 Guide, the most recent one available, Kelowna’s Prospera Place has 6,007 seats and room for 500 standees. On Saturday afternoon, catcher Gary Sanchez of the New York Yankees left a game against the Orioles in Baltimore with an injury. Shortly thereafter, the Yankees announced that he had a right biceps strain. The world didn’t end. Headline at SportsPickle.com: Cubs admit feeling pressure to win a World Series every 108 years now. If this few seconds of video doesn’t make you smile, you need to put a mirror in front of your nose and see if it fogs up. BTW, Dave Tippett, the Phoenix Coyotes’ executive vice-president of hockey operations and head coach, told reporters Saturday that the NHL team is looking to have Craig Cunningham somewhere in its organization. The Toronto Maple Leafs clinched a playoff spot Saturday night and I thought Twitter was going to break. What would happen were the Leafs to win a Stanley Cup? What a Pandora’s Box was opened when sports leagues began using video review. I am almost of the belief that they all were better off without it. Managers, coaches and players all make errors that can’t be undone. Maybe it’s time to put the officiating errors back into the games and life with them. Source tells me Adam Brooks injury is "not good". I hope my source is wrong. Nobody wants to see a 1st class kid hurt. There was a time this season when the Regina Pats’ top three centres were Adam Brooks, Sam Steel and Jake Leschyshyn. We won’t find out until Monday night, but it could be that Steel is the last man standing. . . . Leschyshyn, 17, hasn’t played since undergoing knee surgery in February. . . . Brooks, with 250 points over the past two regular seasons, went down with a leg injury during the first period of Regina’s 6-2 victory over the visiting Swift Current Broncos on Friday night. . . . Steel, of course, won this season’s WHL scoring championship, finishing a point ahead of Brooks, who won that title last season. . . . Rob Vanstone of the Regina Leader-Post has more right here on the Pats with, and without, Brooks. MORE ON THE MOVE: F Tyler Soy of the Victoria Royals has joined the San Diego Gulls, the AHL affiliate of the NHL’s Anaheim Ducks. Soy was a seventh-round pick of the Ducks in the NHL’s 2016 draft, but has yet to sign. At 20, he is eligible to return for one more WHL season. . . . D Micheal Zipp of the Calgary Hitmen will finish the season with the ECHL’s Kalamazoo Wings. 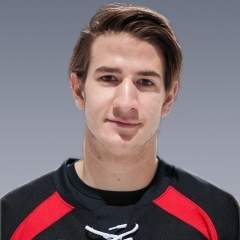 Zipp finished his WHL career this season with the Calgary Hitmen. He played 299 regular-season WHL games, totalling 77 points, 18 of them goals. With the 2nd Everett goal, it ends the streak of the @SeattleTbirds being tied or ahead at 372:52. Last was at end of game vs PDX on 3/18. SeattleThunderbirds got past the Silvertips, 4-3. . . . The Thunderbirds lead the series, 2-0, with Games 3 and 4 in Kent, Wash., on Tuesday and Friday nights. . . . Seattle had won Friday’s opener, 3-2. . . . Last night, the Thunderbirds faced a 2-1 first-period deficit, the first time they trailed in these playoffs. They had swept the Tri-City Americans from an opening-round series. . . . F Scott Eansor (3) have Seattle a 1-0 lead at 7:05 of the first period. . . . Everett went out front on goals from F Bryce Kindopp (1), at 7:56, and F Connor Dewar (1), at 12:52. . . . The Thunderbirds took control with three goals in a span of 5:22 in the second period. . . . F Zack Andrusiak (1) tied it at 11:12 and F Sami Moilanen (2) put Seattle out front just 18 seconds later. . . . D Ethan Bear upped the lead to 4-2 with his third goal, on a PP, at 16:34. . . . The Silvertips cut the gap to a goal at 12:33 of the third period when F Eetu Tuulola scored his fourth goal. . . . Bear added an assist to his goal. . . . Seattle has dressed 19 skaters in these playoffs and 15 of them have at least one goal. . . . Stankowski, who has started all six of Seattle’s playoff games in the absence of the injury Rylan Toth, now is 6-0, 2.17, .921. Stankowski turned 17 on March 9. He was 3-0-1, 2.18, .910 in seven regular-season appearances. . . . Everett G Carter Hart stopped 11 shots. By period, Seattle was credited with nine, five and one shot. . . . Seattle was 1-3 on the PP; Everett was 0-3. . . . The Thunderbirds continue to play without F Ryan Gropp, who was injured in Game 2 against the Americans. . . . Announced attendance: 5,129.
posted a 5-2 victory over the Portland Winterhawks. . . . The Rockets lead the series, 2-0, with the teams now heading for Portland’s Memorial Coliseum and games on Tuesday and Wednesday nights. . . . The Rockets had opened the series with a 4-2 victory on Friday. . . . Last night, Kelowna took a 2-0 lead on second-period goals from F Kole Lind (3), at 7:33, and F Tomas Soustal (2), on a PP, at 9:56. . . . F Joachim Blichfeld got Portland to within one with his third goal, at 18:50. . . . D James Hilsendager, an under-rated but key guy on Kelowna’s back end, got what proved to be the winner at 14:07 of the third period. That was his first goal of the playoffs. 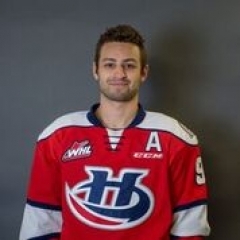 Hilsendager, who turned 20 on March 20, was acquired from the Regina Pats in December. . . . Merkley upped the lead to 4-1 with an empty-netter at 18:40. . . . Portland F Ryan Hughes (3) scored at 19:20. . . . Merkley added another empty-netter at 19:33. Those were Merkley’s first two goals of the playoffs. . . . F Dillon Dube and F Reid Gardiner each had two assists for the Rockets. . . . Kelowna G Michael Herringer stopped 23 shots, while Portland’s Cole Kehler turned aside 38. . . . Kelowna was 1-7 on the PP; Portland was 0-3. . . . Kelowna D Devante Stephens was in the lineup despite having left Game 2 in the second period with what appeared to be an injured wrist. . . . Announced attendance: 5,009.
on Tuesday and Wednesday nights. . . . The host Tigers won the opener, 4-0, on Friday. . . . The teams combined for more goals — six — in last night’s first period than were scored in Game 1. . . . Last night, the Hurricanes erased a 4-3 deficit with the game’s last four goals, the final two both empty-netters. . . . D Dylan Cozens pulled the Hurricanes into a 4-4 tie at 8:37 of the second period with his first WHL playoff goal. . . . Cozens, who turned 16 on Feb. 9, is from Whitehorse. 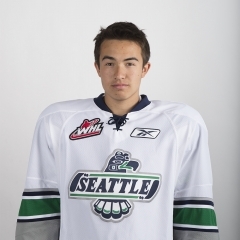 He was the 18th overall selection in the WHL’s 2016 bantam draft. He had one goal in three regular-season games with Lethbridge. Cozens played the past two seasons at the Yale Hockey Academy in Abbotsford, B.C. . . . Estephan snapped the tie with his second goal of the game, on a PP, at 12:51 of the third period. That was the first time in these playoffs that the Tigers had trailed. They swept the defending-champion Brandon Wheat Kings from the first round and didn’t trail even once in the four games. . . . Estephan completed his hat trick with an empty-netter at 18:35 and F Tanner Nagel added a shorthanded empty-netter at 19:12. . . . Estephan has five goals in these playoffs; Nagel has two. . . . The Tigers had taken a quick 2-0 lead on two first-period goals from F Zach Fischer, at 0:20 and 2:23. He’s got six goals. . . . Lethbridge tied it when Estephan scored at 8:16 and F Alec Baer (3) counted at 8:43. . . . Medicine Hat went back out front when F Ryan Jevne (2) scored, on a PP, at 11:10. . . . F Tyler Wong pulled the Hurricanes even with his sixth goal of the playoffs, at 17:33. . . . F James Hamblin (1) put Medicine Hat back out front at 6:03 of the second period. . . . Wong also had an assist for the winners, while F Steve Owre had two for the Tigers. . . . G Stuart Skinner stopped 26 shots for the Hurricanes. . . . Medicine Hat got 19 stops from G Michael Bullion, who lost for the first time in six playoff starts. . . . Each team was 1-5 on the PP. . . . Lethbridge was without F Matt Alfaro and D Calen Addison for a second straight game, while F Zak Zborosky, who played Friday, was scratched last night. . . . The Tigers remain without D Brad Forrest. . . . Announced attendance: 4,513.